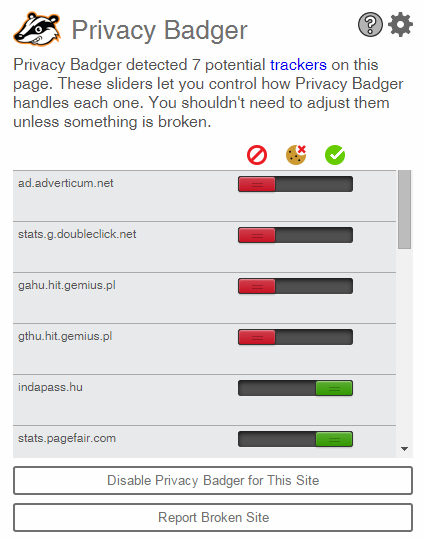 Privacy Badger prevents advertisers and other companies from using trackers to collect online behavioural data from sites you visit on the Internet. It is open source, but plugins of browsers have access to all the data of the visited websites. browsing in incognito could be a substitute for this. 1. Click on “Install Privacy Badger” at https://www.eff.org/privacybadger to add the extension to the browser. When using Privacy Badger for the first time, all the bars will be green. This is because the application doesn’t use a predetermined list, but learns during browsing which sites to categorize as trackers. 3. You can modify blocking/allowing manually. You can also disable Privacy Badger completely for a site by clicking on “Disable Privacy Badger for This Site” .